On September 27, 2018, Hamilton CAS staff will be commemorating the Residential School experience and honouring the experience of survivors and their families through participation in Orange Shirt Day activities. 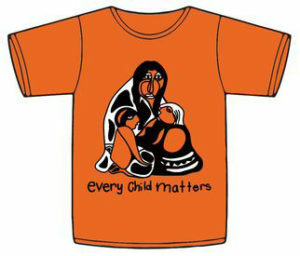 The Orange Shirt Day Campaign is designed to commemorate the residential school experience, to witness and honour the healing journey of the survivors and their families, and to commit to the ongoing process of reconciliation. As we have committed to travelling on the journey towards Truth and Reconciliation, we pause to learn from survivors like Phyllis (Jack) Webstad, a survivor of St. Joseph Mission Residential School, who shared her story of losing her shiny new orange shirt on her first day of school at the Mission. The symbol of her orange shirt has become an opportunity to keep the discussion on all aspects of residential schools happening annually across the country. We are honoured to take part in this very important campaign.